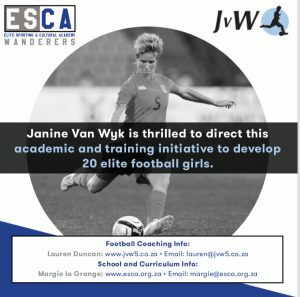 The JVW Girls Football Development Program was founded in 2012 by the South African Senior Women’s National Team captain, Janine van Wyk. Van Wyk, who has been playing football since the age of 5 and currently the highest capped footballer in the Country, wanted to give young girls opportunity to play football in a structured and competitive environment, where they have opportunity to achieve their goals and aspirations in the sport. With the vision to raise the standard and level of women’s football in South Africa, van Wyk launched a program which currently serves as a platform for female football players to excel in. Consisting of a High School League, boasting over 160 teams, and a Football Club which caters for girls from the age of 9, the Program sees more than 3000 girls actively participating in the program each year. The JVW Football Club was established in 2013, with the intention to focus on the development of the female football player whilst providing a platform for them to reach higher levels in the sport. Catering for girls from as young as 9 years old, JVW FC offers girls the opportunity to learn, grow and play in a professional-like program where they are able to pursue their football journey. 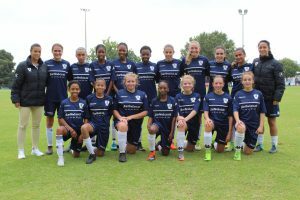 The JVW Girls School League was launched in 2012 in Gauteng, with a mere 12 teams participating in the league. After 7 successful years, the League has grown tremendously and now boasts over 1600 girls teams throughout the Gauteng Province. Players have been scouted from the league into club and National Team structures. There are a number of ways to get involved in the Program. Be it as a Player, a Parent, a Supporter or just a Fan, we welcome friends of our community to get actively involved in the development of women’s football. Of course such programs need a good sense of stability too, to ensure all members benefit in a positive and progressive way. You may also have a look at the sponsorship opportunities available within the Development Program. Your support in any means is welcomed and is important to us as we grow Women’s football to greater heights.